We will be cooking up a storm outside the shop, so pop down and grab a sausage in a roll to keep you warm while you check out the stalls and events on offer. These will start from 4pm with the road closing at 5.30pm. The parade itself starts at 6pm from the traffic lights at Uxbridge Road. Street re-opens to traffic at 8pm. Father Christmas will be there so bring the little ones and wrap up warm! For all you lovers of cake, our friend Anna will be at the shop every Saturday with her beautiful cupcakes and sweet treats for special occasions. She is just starting out on her own and we are thrilled to have her as part of our network of local producers. 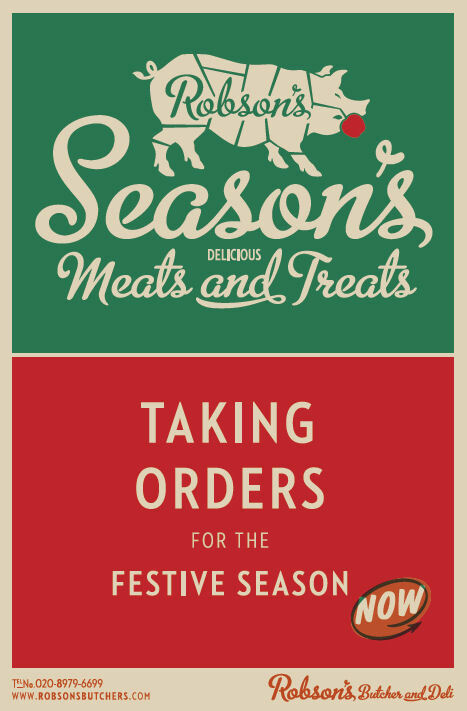 The last of Autumn’s leaves are turning – which means our Christmas order book is open! Come into the store or give us a call to place your order. 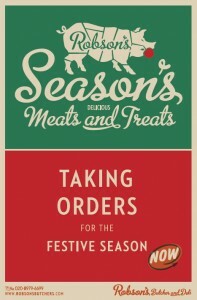 We have all our usual variety of meat and deli goods as well as some great Christmas additions. Our turkeys come from Temple Farm. We have used Chris for years because of his great tasting birds and sound animal welfare practice. He supplies us all year round with his Label Anglais chickens too – we wouldn’t want any other Turkey on our festive table! Choose from whole birds, crowns, rolled boneless breasts (stuffing optional) all to suit your party’s size and tastes. Free Range Geese and Ducks from family team, Howard and George at Herons Farm. Free range Three Bird Roast, layered with a choice of stuffing – Popular combinations are Turkey, Goose and Pheasant; and Goose, Chicken and Pheasant or choose your own combination of birds and stuffing and make it uniquely yours for the festive table. If you would like more than three birds, just ask the butchers. Dry cured Gammon, choose from smoked or unsmoked and on or off the bone. Cooked Honey Roast or Gammon Hams to make things a little easier and give you more time with the family. Our gorgeous 28-day Aged Beef, including delicious Rib of Beef – a fabulous centrepiece – Sirloin, Rib-eye and Topside. Large legs, shoulders or saddle of Lamb for roasting. Everyone’s favourite, our Free Range Pork – including our ever popular shoulder and loin, rolled or on the bone. Rolled Haunch of Venison for roasting. Game Birds including, Pheasant, Partridge, Guinea Fowl. Choose from our existing cheese range or if there is something specific that you would like we can order it in for you. Festive favourites are Colston Bassett Stilton, Black Bomber Cheddar, Vacherin Mont d’Or to name a few. Our Hampers can be made up to suit any budget and taste or simply buy one of our Robson’s Gift Vouchers – a great present for a foodie or someone who loves to cook and these start from £5. (if you miss the deadline, we will of course try to help you, but choice does become more limited closer to the Holiday, particularly with regard to sizes). You can also place orders for your New Years parties before Christmas. We are a traditional butchery and use whole sides of beef, lamb and pork so that we can provide you with any cut you prefer. If you’re not sure what to cook for centrepiece or sides, need some advice, or are working to a budget, just give us a call – we’d love to help. I have recently been asked for some lamb recipes, so here are a few that we love. This was originally a Nigel Slater recipe that I have changed a bit. It’s very simple and perfect for cold winter nights. I normally serve it with rice or potatoes, but it is gorgeous with crusty bread to mop up the sauce if you just want a quick one pot supper. Pre heat your oven to 170’c or Gas 3. Dust the shanks with flour and brown them in a large casserole dish with just enough oil to coat the bottom of the pan. Remove the shanks and lower the temperature before adding the onions and garlic. Cook them until they are glossy and a nice golden colour. Add the tomato and Harissa pastes and the cinnamon and cook for a minute or two before adding the tinned tomatoes. Return the shanks to the pan and pour in enough water to almost cover them. You can add a bit of salt at this point – a big pinch is enough. Bring to the boil and then cook it in the pre heated oven, covered for about 2 to 2 and a 1/2 hours. the meat should be falling off the bones. Remove the shanks, scoop all the oil off the surface of the sauce and then simmer the juices until they reduce and thicken up a bit and then season with the salt and pepper and pour the sauce over the shanks or pop the meat back in with the juices and just serve straight from the pot. Heaven. I have made this recipe in a slow cooker too and it takes at least 2-2.5 hours on medium to high or leave overnight on a lower setting. Appliances vary, so look at the manufacturers guidelines. 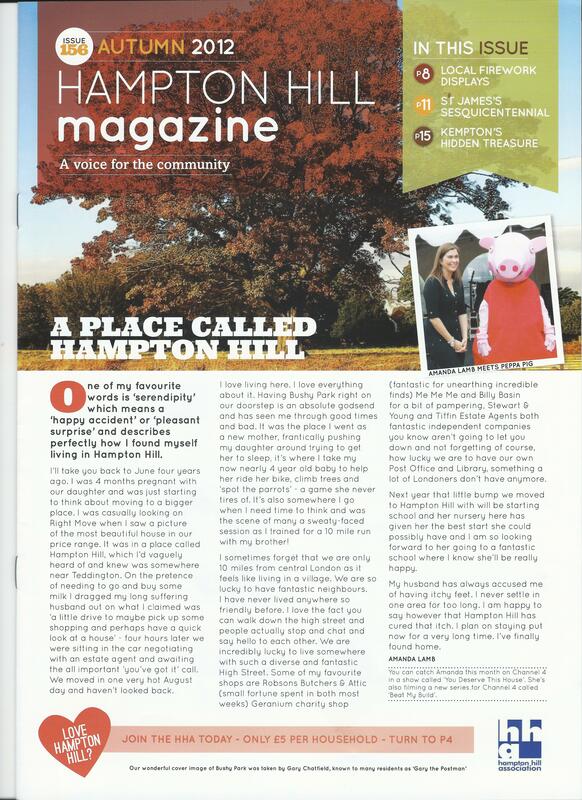 This was published in the Hampton Hill Association magazine this summer, but here it is again if you missed it. Mix the breadcrumbs, parmesan, parsley, garlic and a drizzle of olive oil quickly together in a food processor or by hand if you don’t have one. Heat a large pan until hot and fry the rack, skin side down for 2 minutes until well browned. Brown the rest if you like, but don’t over-cook it. Brush the hot rack liberally with mustard and cover with the crumb mix, pressing firmly to make sure it sticks. Traditionally only the fat is covered, but you can roll the whole piece in the crumb mix if you prefer. Pop it back in the pan or on a baking sheet and cook in the preheated oven for 25-30 minutes depending on the size of the rack. Best a bit pink inside! I couldn’t resist posting this! We have had it on facebook for a while and I am still laughing at Scott.